Reproduction of a 1898 map showing the buildings along Chequers Lane. 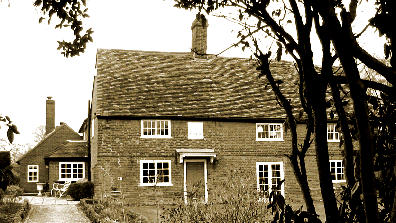 Thomas Sharp, a woodman, was living at Spindle Cottage in 1881 -1891. 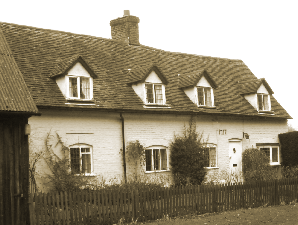 Then, after her husband David’s death, Hannah Frost moved from Castle Farm Lodge to Spindle Cottage where she is recorded as keeping the village post office in 1901 and 1910. The hay dealer, Frank Brown lived at Sadleirs End from the 1870s until the early twentieth century. Frank Brown’s brother, John (a wheelwright) lived in the adjoining cottage 7 in 1881. Then, in 1884 Mary Merritt ran a grocery shop from these premises. William Jeeves had moved from The Chequers Inn to Castle Farm Lodge by 1901. 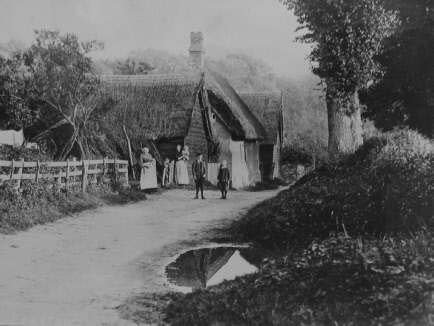 It is relatively easy to research those who lived in the cottages on the north side of Chequers Lane and on the Hitchin Road in the nineteenth century and they are listed below. Assigning them to specific cottages is more difficult. My grand parents, Alfred and Emily Wray, were living at cottage 4 in 1901 and 1910.